The mist hung heavy this wonderful Wednesday as the bugle sounded. Campers far and wide rushed onward to breakfast to feast on biscuits, eggs, and hash browns accented by butter, jelly, and gravy. Such a wonderful breakfast kept all of us wondering how the day could get any better, but as things always do at Timberlake they did. The morning yell progressed to cabin clean up, which was promptly won for a second day in a row by our youngest cabin: Tomahawk. These young campers seem to have the drive and passion for cleanliness that cannot be matched, so we all congratulate them for setting such a high example. Chapel was led by our own, Matt H. who spoke about how our own pride has a way of getting the best of us (Colossians 3:15-17). It was a heart felt message that I am sure many of the campers will use in their lives. Classes came with their own successes. Jake J. spent his time in tennis learning his forehand hit. Pottery class made pinch pots, while air soft had the very first match of the year with Josh H. and Keifer M. dominated. Other classes such as climbing, fencing, among others spent time introducing students to the activity and helping them to know how to be safe. As the day progressed the sun began to rise over Lake Doris. With the sun at its apex, lunch was prepped and consumed. Lunch consisted of chicken nuggets, fries, and of course popsicles. The necessary sauces such as ketchup, honey mustard, barbeque sauce, and of course sweet and sour sauce accented all this. Rest time, which during a hot day, can be the best time allowed campers a chance to recharge and perhaps enjoy a good book in the cabin. With free time approaching some counselors decided to set up some activities to allow campers the chance to hang out and work on their skills. Climbing opened up the brand new wall for climbing. Three lines were set up for climbers to enjoy. Brooks M. and George S. rocked it out there (forgive the pun). 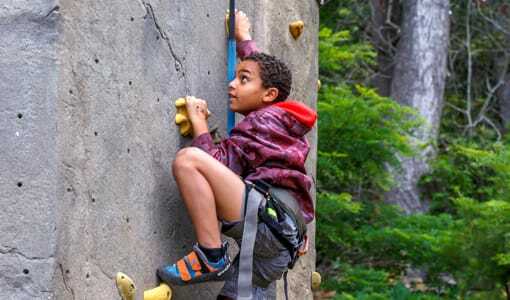 Brooks M. explained his joy for climbing by releasing a might yell at the top of the wall to let his fellow campers understand the joy that he felt from being up so high. Rocketry also opened its doors to campers allowing them to refine their crafts in preparation for the day to come where they could launch them. This was another worthy way to spend free time. Those who chose other activities enjoyed tetherball and the thunder ball pit. 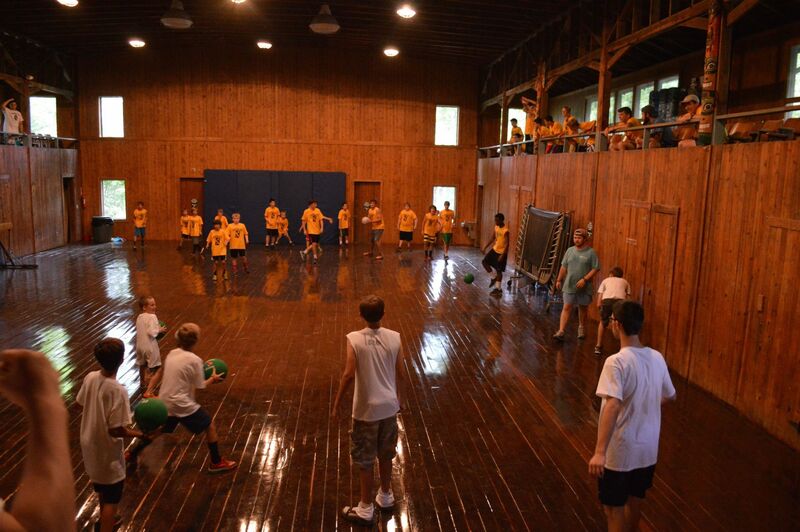 Thunder ball is a tasking game where participants attempt to get others out by hitting a dodge ball at others’ feet. Two men stood out among the crowd to dominate the ring. One was Keifer M. who played like a master. The other was one of our counselors named David F. His efforts in the ring were not left in vain. Perhaps soon the two will meet to play the other, but for now we will have to wait. In other news Tomahawk set sail on the adventure of a lifetime. Counselors helped campers to make a cardboard boat that they carefully placed an origami elephant on to set sail. The boat proved to be a success until the dreaded “waterfall” at the local stream became to tasking for the structural integrity of the craft. A successful first trip attempted by these men that will hopefully not be the last attempt at a proper voyage. Elections were also held today which included the finding of Medicine Man and Chief. The mighty Iroquois chose Quinn M. as there Chief and Peter M. as Med. Man. The powerful Seminoles decided upon Will C. as their Chief and Josh H. as their Med. Man. I am sure that these were great choices for the job and will set a wonderful example of how men of God should act in a position of leadership (as they have done thus far). Not to be forgotten in this article is what happened the night before as well as tonight: the evening activity. Last night was held the first sock war of the summer season. The Iroquois and Seminoles gathered their forces together and of course each collected a spare sock as their “weapon” of choice to help bring them to victory. This game of capture the flag has the added twist of a sock as a long range projectile for tagging opposing teams trying to grab their flag. With Great success the Seminoles triumphed over the Iroquois. It was a noble victory, and both teams played well. Tonight as I write this article those same teams are battling it out in a game of battle ball. A clever game of skill and tactics where teams choose how to best others with dodge balls. Which team will win? None can tell, but I am sure it will be a fun time for both sides. One final addition I would like to mention is something I was told by another counselor. As we all know camp does not just foster fun, but it also fosters the opportunity for campers to step up and show Christ to others. Today was no exception. 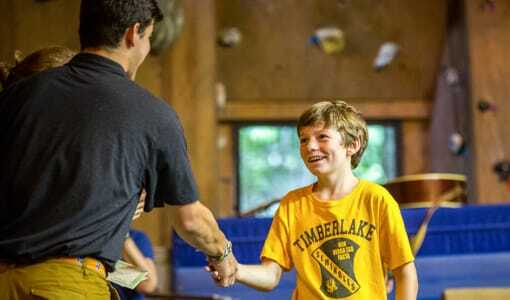 One gentleman, Tyler S., showed Christ by helping one camper find something they had lost throughout the day. 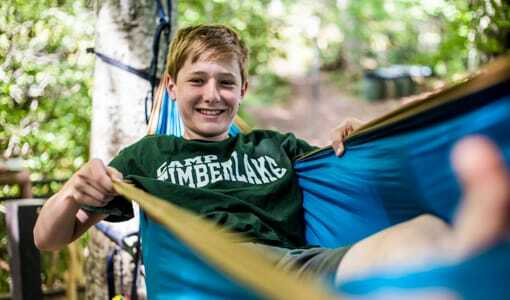 It is sometimes the smallest actions that can make camp such a great experience. Sadly this ends my journaling time. 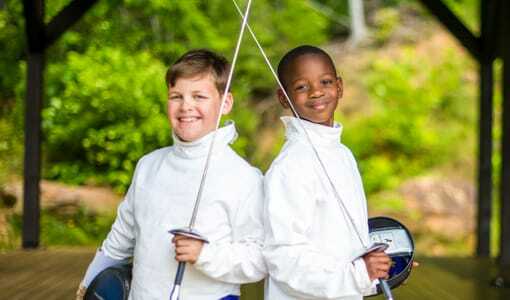 My hope is this gives you a little incite into the lives of your children here at camp. 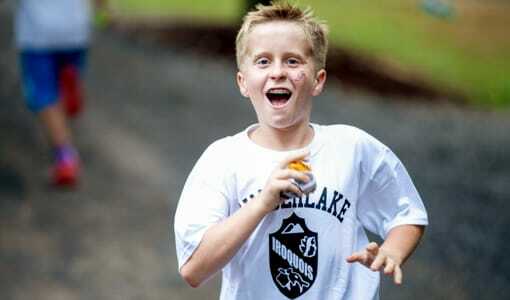 The smiles I see on each one of the campers is hard to express in words, but they are there. We will continue to keep you updated on the happenings here and hope you continue to read and view the pictures. P.S. 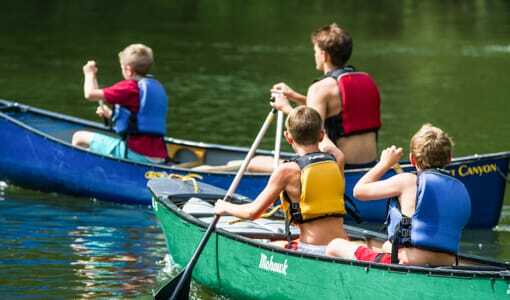 Look forward to hearing about some awesome out of camp trips to come such as climbing, boating, and others.